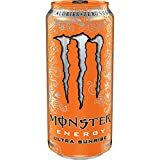 Monster Ultra Sunrise is part of Monster's zero calorie Ultra line but has 10 mg more caffeine per can than the other flavors of Ultra. See how it tastes here. 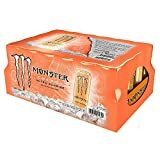 Carbonated Water, Natural Flavors, Erythritol, Lemon Pulp, Taurine, Citric Acid, Calcium Lactate, Panax Ginseng Extract, Potassium Sorbate(Preservative), L-Carnitine L-Tartrate, Ascorbic Acid(Preservative), Caffeine, Sodium Citrate, Sucralose, Niacinamide (Vitamin B3), Acesulfame Potassium, D-Calcium Pantothenate (Vitamin B5), Salt, Guarana Extract, D-Glucuronolactone, Inositol, Pyridoxine Hydrochloride (Vitamin B6), Yellow #5, Yellow #6 and Cyanocobalamin (Vitamin B12). How Does Monster Ultra Sunrise Compare? Monster Ultra Sunrise contains 9.38 mgs of caffeine per fluid ounce (31.70mg/100 ml).